Cinco De Mayo is coming up and it is time again to catch up with old friends and family members, right? For many of us, it is only occassions as these that bring us close to our near and dear ones who we fail to meet during the course of the year. But while you get the opportunity, is it not a nice thing to make the meeting memorable too? After the initial talks are over and the food has been gulped down, here are a few movies you can watch together with dear ones during Cinco de Mayo and make the occassion worth remembering. If you like our Cinco de Mayo Movie Suggestions, click here to share them with your friends. TheHolidaySpot wishes you a grand Cinco de Mayo! Add some more Mexican flavour to your celebrations with these nice movies. Cast: Salma Hayek, Alfred Molina, Geoffrey Rush, Ashley Judd, Antonio Banderas and others. 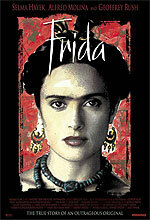 This double Academy Award winning 2002 film has the beautiful Salma Hayek giving one of the brilliant performances of her career as the titular character, the famed Mexican painter Frida Kahlo. The movie traces Kahlo, from a feisty schoolgirl to a world-renowned artist who produces many masterpieces despite physical disabilities. "Frida" also shows Kahlo's relationship with her traditional mother (Patricia Reyes Spindola), her philosophical father (Roger Rees) and of course, the famous Mexican painter Diego Rivera who takes her under his wing as an artist, a political revolutionary, and, inevitably, a lover. This touching biography is for those who love to watch slightly serious celluloid works with a few select friends. 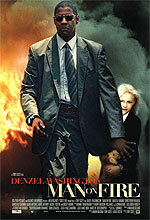 Cast: Denzel Washington, Dakota Fanning, Christopher Walken, Giancarlo Giannini, Radha Mitchell and others. This kickass action flick finds Denzel Washington as Creasy, a former United State intelligence agent turned mercenary, who is frustrated with his life of violence and corruption but is hired to act as a bodyguard for Lupita (Dakota Fanning), a 10 year old daughter of a wealthy family living in Mexico City, where kidnapping has become common. While watching over Pita, Creasy becomes fond of the girl, and finds himself regaining some of his faith in humanity. But after a sudden attack by gunmen leaves Creasy badly injured and Pita is abducted by the same miscreants, the toughie recovers and sets out to bring back his little object of affection no matter how many bodybags he has to arrange for. Based on a novel by A.J. Quinnell, the movie shows a Mexico that is corrupt, lawless and dangerous. Cast: Antonio Banderas, Joaquim de Almeida, Salma Hayek, Steve Buscemi, Quentin Tarantino and others. 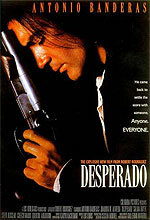 Filmed by acclaimed director Robert Rodriguez, "Desperado" is the story of a happy-go-lucky guitarist El Mariachi (Antonio Banderas), whose search for a good job gets him thrown into a world of violence and mayhem and turns him into a gun-toting one man army who is feared by even the toughest of criminals. This stylish film nicely captures the atmosphere of Mexico and gives its viewers some cool action scenes and an adrenaline rush. Cast: Antonio Banderas, Salma Hayek, Johnny Depp, Mickey Rourke, Eva Mendes and others. A follow-up to the 1995 hit "Desperado", this action movie has Antonio Banderas and Salma Hayek reprising their roles as El Mariachi and Carolina. After the death of his lady-love Carolina, Mariachi had been living quietly until a rogue CIA agent Sands (Johnny Depp) finds him and lures him back into action through the promise of a final showdown with his nemesis General Marquez (Gerardo Vigil), a corrupt military leader who along with a ruthless drug kingpin Barillo (Willem Dafoe) plans to assassinate the Mexican president (Pedro Armendáriz Jr.). How Mariachi and Sands join hands and battle their vicious enemies form the crux of this Robert Rodriguez directed action spectacle. Cast: Antonio Banderas, Anthony Hopkins, Catherine Zeta-Jones, Stuart Wilson, Matt Letscher and others. 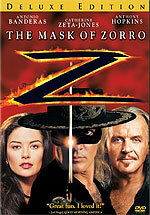 This lavish Hollywood production is set in the scenic 18th century Mexico and tells the story of Zorro, a.k.a. Don Diego de la Vega (Anthony Hopkins), a renegade who comes out of prison to avenge the murder of his wife by his arch rival Don Raphael Montero (Stuart Wilson) who has also raised his daughter Elena (Catherine Zeta-Jones). With a tarnished young apprentice, Alejandro Murieta (Antonio Banderas) as his sole weapon, Don Diego attempts to infiltrate Montero's plan to take control of California from Santa Anna. After undergoing an extensive training session in swordfighting from Diego, Murieta appears as the new masked superhero Zorro and wreaks vengeance on Diego's and his own enemies as well spares some time to steal the heart of the grown-up Elena. This thumping hit makes for a fine festive watch.